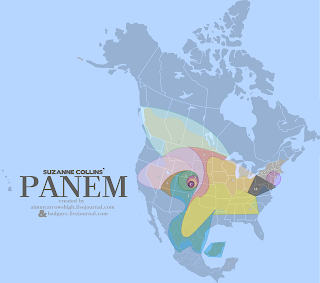 Panem map by Aim My Arrows High and Bad Guys. As a feminist blogger who writes about the significance of the ways we present ourselves, I’m required by law to write about The Hunger Games. This, reader, is that post. To give you an idea of where I’m coming from, I devoured the trilogy in a week, and endured the three days of slow torture between the film’s release and my having a chance to see it. I’m usually the curmudgeonly snob who comes in and says that anything so wildly popular can’t possibly merit the hype. I read, then filleted, a handful of pages from Twilight; I saw part of one of the Harry Potter movies and felt a wave of gratitude for my IUD ensuring I'll never be forced to watch such things against my will. But The Hunger Games had exactly what I wanted, and once I got over myself enough to admit that Suzanne Collins had squarely and accurately targeted me, I gave in wholeheartedly. In a nutshell: Love the books, liked the movie, don’t think the film would have nearly as much value for those who hadn’t read the books. And my thoughts here probably aren’t anything new, which I’m glad for; I’m thrilled that these books have provoked such levels of cultural analysis. What I have to say boils down to this (and if you’re determined to avoid any and all plot points until you’ve finished the trilogy, stop reading now): The Hunger Games masterfully explores the division between the self and the public self. We see various ways characters cope with this enforced gap—Peeta doesn’t just grin and bear it but thrives, Cinna plays his cards so close to the vest that it takes two books before we learn what he’s really about, and even Cato (in the movie, at least) is shown as finally questioning if he even has a private self, being trained since birth for his death. And here’s what I think is so remarkable about the trilogy: The division between public and private life is framed through a manipulation of Katniss’s femininity, but that femininity is seen as a means to an end. The books aren’t so much a critique of the construction of femininity as a critique of the ways it serves the existing power structures. It’s a Marxist/anarchist feminist critique, and though I consider myself neither a Marxist nor an anarchist, I’ll say this: The more material illuminating that feminism exists not because men want to keep women down but because the status quo has an investment in keeping people divided and with diffuse power so as to keep power concentrated where it already is, the better. Katniss is taught to use her “feminine wiles,” but those wiles are exposed for what they are: favor-currying tools that keep women scrambling over false power while the real power lies elsewhere. The manufactured Katniss-Peeta romance only gets the pair to the point where they have to rely on their actual strengths—ingenuity, solidarity, and rebellion. The currency of compliant femininity, in the end, is worth little. Critiquing the power structure behind femininity is a clever ploy on Collins’s part, both as a writer and as a businesswoman, for the simple reason that it seamlessly reveals how women’s issues aren’t solely of concern for women. I couldn’t find information on what the gender breakdown of the book’s audience is, but I can only imagine that a greater number of boys read—and just as important for Collins, bought—The Hunger Games than have read any other book featuring a female protagonist in recent years. (As for the film, the New York Times reported that 39% of the film’s audience in the opening weekend was male.) I absolutely don’t want to devalue literature aimed squarely at girls, so I’m not trying to say that The Hunger Games is somehow better because of its appeal to boys. But not only does it do its part to balance the gender history of great YA lit and expose boys to some feminist issues—that prettiness is constructed, and that serving as decoration isn’t natural to girls any more than it is to them—it also casts light upon the ways our assumptions about day-to-day behavior and personality can be shaped to serve a purpose that isn’t our own. It's a lesson in how manipulation of our public persona can wind up muddling our true intent, something that "the kids," boys and girls alike, are now forced to be keenly aware of because of their own ability to create public personae. As Rob Horning writes at Marginal Utility: “It’s not clear even to [Katniss] in the end whether her emotional reactions are real or strategic performances.” One of the trickiest parts of examining emotional work is that it can be difficult to know what we’re doing because we’re expected to do it as opposed to because the situation or our temperaments call for a certain action. The allegory of the games as the constant surveillance of social media makes sense, and Collins skillfully uses the romantic story line to illuminate the ways the manipulation of our own emotions can alienate us from them, which has a long history of being gendered but which is also endemic to the self-branding necessary to social media. As Subashini pointed out, it’s interesting that Peeta is better at not being alienated by his emotions, since it’s women who are often thought to be both more in touch with our feelings and better able to manage them. My hope is that The Hunger Games can create a chink in that idea, exposing the ways in which calculated self-presentation can muddle what is thought to be innate and true. And the more we all recognize the price of those calculations—not just women, but anyone at the mercy of a larger state power or under surveillance, which is to say all of us—the better we may be able to figure out whether we’re actually willing to pay it. This is a great deconstruction of many elements I didn't even realize were present in THG! I, like you, consumed the trilogy very quickly. I loved it, but hadn't thought about it this deeply. I think the comparison between Katniss's public and private self only become more interesting and complicated in the third book. She has become this revolutionary figure yet she doesn't want to be. She's a very different person that the child she was in the first book. It's interesting that the roles Katniss finds herself in are not those she has chosen for herself. She's the glamorous young girl who falls in love. Then she's the revolutionary figure. Never are of her own choosing. Feminism aside, I hated Katniss by the end of the third book. I think she deserved to be alone and unhappy at the end of the trilogy. But yeah, I can't lie. I still cried. Courtney, the third book is fantastic in exploring these issues--I love the part where Haymitch points out that everything that truly made Katniss who she is came from her own actions. I loved Katniss throughout! Why did you think she deserved to be alone and unhappy? I genuinely found her sympathetic. This was an excellent analysis, and an interesting angle I hadn't considered. I don't have anything else to add...except that like you, I had no interest in the other huge pop culture hits (Twilight and Harry Potter) but I was totally hooked immediately on The Hunger Games and finished all 3 books in a week as well! Heh, glad I'm not alone! I was wondering if my cynical-gal cred was going to pot... I wonder what exactly it is? It's not just that it's an interesting female character, though that's part of it. I dunno, who doesn't like a battle to the death? I don't know what it is either, but I too had no interest for Twilight and Harry Potter, but absolutely devoured The Hunger Games. I read the trilogy in just three days a while ago, and couldn't understand why I hesitated to do it in the first place. I guess the marketing is to blame. THG are somehow very realistic, way better and dealing with more serious issues than HP ever managed to touch (and I'm telling you as a devotee of both series). But the thing is until reading this post I didn't pay much attention to feminism issues incorporated in The Hunger Games trilogy. Yes, I recognized some deep community problems Capitol and our own world of XXI Century share, e.g., the similarities in the obsession with style, reality shows and scandalous personalities. But I must admit you have a point too. THG are more than just a YA novel. Autumn, thank you for making me reconsider the significance of this masterpiece! P.S. I disagree with Courtney. Katniss didn't deserve to be left alone and miserable at the end. At war times (and the Games can be considered as such as well) the consequences of one or another choice can't be predicted. There are too many variables in the equation. Katniss was a victim of the situation alongside Peeta, Haymitch, Katniss's mother etc. Besides, she was a very confused girl in her late teens too. And so, no, I think the ending was very good. I wouldn't call it a happy ending, because a war can't have a happy ending, it can just end. So many are dead, places are destroyed and minds are harmed. The world just goes on as if nothing happened, and people are left to deal with it the best way the can. And the best way for Katniss and Peeta is to deal with it together. Autumn, the marketing I'm talking about are TV ads. In my country (Latvia) "The Hunger Games" was advertised as breath-taking world's bestseller (well, now I know it's true to core), but it was done in the same visual way and by the same low, rumbling blockbuster voice as in the "Twilight" ads. And the books looked very alike - solid black cover with a single bright picture on them. I went to book exibition shortly after the first airings of the TV ads, and there they were, the new books were piled in a mountain and people crowded around them. Just like with "Twilight". And as I think that reading "Twiligt" was sort of wasting my time, I thought it's not worth to even try THG. But I'm happy that my assumptions turn out to be wrong from time to time! I, for one, didn't feel that The Hunger Games exposed me to any feminist issues. Obviously since Katniss is female the issues she dealt with were gender-specific. What women who read this book might not realize is that men also have roles that society pressures them to fulfill. Even though I'll never be expected to wear a dress and high heels, I know what it's like to be pressured to do something I don't value the way society does. I'd be interested in the story of one of the male tributes who died. He apparently didn't live up to society's expectations of masculinity i.e. physical prowess and mental toughness. Most men in the real world probably don't. It'd be interesting to see how he deals with that - hard to tell him it doesn't matter any more than it matters for a girl being tall, blonde, and 20 lbs underweight. His life (and maybe his family's, if he provides for them) is on the line. Shaun, what I thought was so great about the books was that it was clear that what Katniss was dealing with WASN'T gender-specific. The idea that because it happens to a girl, it's a girl issue, but that if it happens to a boy, it's a universal experience--that's problematic because it takes men to be neutral and women to be a variation. Some of Katniss's concerns were female-specific--like how she doesn't know how to be conventionally feminine--but I thought the book beautifully showed that this was what ALL the tributes (and indeed, all the characters) had to deal with. Peeta is skilled at playing up his feelings for Katniss but he still resents it--that's a pressure. He's really the one who gave Katniss the idea about showing the Capitol that they weren't playing the game on their terms. They are ALL showing that they're being pressured to do something they don't want to do. Nobody is saying it's specific to women--anyone paying attention would know otherwise. The character of Finnick (who shows up in the second and third books) has an interesting character arc about masculinity--he's portrayed as being super-virile and masculine, but we learn information about him in the third book that shows how much of that was a tool employed by the Capitol to keep him in line. You might enjoy the story line--I thought it was fascinating, and he's a compelling character.